Nothing paranormal in this picture but while it was taken the light above it flickered wildly and continued to every time we tried to take additional pictures no mater where we stood as if to deter us. Once we stopped, the flickering stopped. 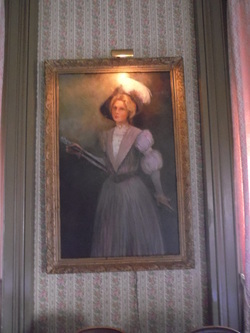 This is a picture of "The Lavender Lady" of Lemp Mansion in Saint Louis, MO. Her name is Lillian Lemp, she was married to William Lemp Jr. Although she did not pass away in the home this picture is in the same room where William Jr. hung himself on December 29, 1922. There were reports of bad blood between Lillian and William Jr. She filed for divorce in 1908 citing desertion and cruel treatment. Anomalie caught on the 2nd floor of the Old Arkansas Tuberculosis Hospital. Soldier apparition with duffle bag in main hallway at Fort Chaffee Medical Complex. RED EYES!! Demon? Big Foot? No, probably just an owl, but no one saw it, whatever it was. Taken at Fort Chaffee Medical Complex near the bowling alley. More eyes... kind of hard to see.